It's a cool, rainy spring day in Montana. Perfect for grabbing a cuppa joe and curling up with a good book right? I wish. But if you can, do it. So most of you know I love coffee. I was actually driving home from work the other day wondering if this was borderline addiction because I couldn't wait to get home for my afternoon - before dinner - cup. I wondered if someone asked, would I be able to stop? I also have a slight addiction to mugs. Seriously. I have some that are colorful and fun. Some from certain companies I love. Some that I've had since I was little that I cannot part with. So, do I need more? No, I need more storage tho!! After pursuing Pinterest, I finally decided to create a better Coffee Bar. I previously repurposed this cute lil cart I got for $10 and have been using it here for our Hot Drink Station. (We have tea and hot cocoa stuff too.) And I had a couple mugs here. However, I wanted more. I painted the wall with chalkboard paint and added some barnwood shelves. I was able to keep a couple of my small coffee related signs. The one says Caffiene maintains my sunny personality. It was given to me with DeCaf coffee. I don't know what to think about that. I used a Chalkboard Marker to add the sentiments. I hand drew them, so not pretty. But fun and cute. I have some of my mugs displayed and just got these cute Marquee lights from Avon! Yes, how cute!! I love having this fun little area set up - and it's easy and welcoming for guests to get some coffee. So, now I need more mugs!! Affiliate Links Used at no extra cost to you!! Today ONLY!! 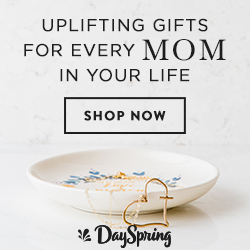 - DaySpring has BOGO mugs! Head over there and check it out!! These would be great gifts for Mother's Day!! Thanks so much for visiting today!! Enjoy your day - May your Coffee Cup never run dry!